Even great movies are occasionally bogged down by a few terrible lines of dialogue in an otherwise great script. On the other hand, a few especially bad lines can help a terrible film achieve cult status. These anomalies have created some pretty memorable movie moments, even if it's for all the wrong reasons. Blame the writer, or blame the actor; these things happened, and they cannot be unseen. Here are some of the worst lines in movie history. Most people agree that Mortal Kombat is a better video game series than a film franchise, but the '90s were a crazy time for game-related media, which is how we got Captain Lou Albano awkwardly bumbling through the Super Mario Bros. Super Show. Mortal Kombat: Annihilation is loosely based on the events of the Mortal Kombat III game, and in this notable scene, Kitana is surprised to see her mother Sindel alive, as Sindel had previously committed suicide to escape Shao Khan. Actress Musetta Vander's delivery of Sindel's dramatic response to Kitana is the strangest moment of many in this unusual adaptation. A film people hate to love and love to hate, Troll 2 is so weird that it's even the subject of its own documentary, 2009's Best Worst Movie. It bumbled its way to unintentional legend status through a series of accidents and coincidences, including a director who couldn't speak English (and insisted on his script being read verbatim) and amateur actors drawn from nearby towns and mental hospitals. The result is magic. In one of the film's most iconic scenes, a visiting teenager, paralyzed by goblin magic, watches as a pretty girl dissolves into plant matter for the local trolls to eat—all while he shout-narrates the whole thing. Even the fly on his forehead seems confused. L. Ron Hubbard's Battlefield Earth is an 800-page sci-fi epic about an alien race of Psychlos who come to Earth and enslave humans for a thousand years. The film version of Battlefield Earth stars John Travolta (who also produced) as the ridiculous, scheming Psychlo Terl, who is hated even by his own people. There's not a lot of context needed for the film's most absurd scene, aside from the fact that "kerbango" is an alcoholic drink, so Terl's seductress is basically offering to make him as happy as a really drunk, starving baby. Love it or Jar-Jar it, The Phantom Menace is one of the relatively few parts of Star Wars canon that remain after the great Disney cull, so you can't ignore it. Young actor Jake Lloyd was reportedly chosen because he looked a little like Leonardo DiCaprio, who George Lucas was eyeing to play the slightly-older Anakin Skywalker, but Lloyd just couldn't work with Lucas' stilted dialogue. As a result, we have Lloyd in the strangest scene from The Phantom Menace, where he announces his favorite flying "trick" in the middle of an intense firefight—even though it really isn't much of a trick. Only the third or fourth weirdest entry in Isabella Rossellini's filmography, Tough Guys Don't Dance tells a complicated tale of 1980s drug abuse, swinging, and a couple of ladies' severed heads just kinda showing up in a dude's stash. It's thoroughly over the top in just about every way, but there was probably no effective way to deliver the film's most notable scene. Writer Tim Madden goes on a drive to read a letter from his ex-girlfriend, which contains a revelation that causes him to spin around on a beach and chant barely-believable words of disbelief. Believe it or not. When Nic Cage is involved, you know you're going to get a pretty amazing performance, because no one captures the human experience the way he can— perhaps because he might not be entirely human. The Wicker Man is a 2006 remake of a classic 1973 drama, but unfortunately, the modern version is now regarded as an "accidental comedy" (which Cage maintains was intentional). In the film's final scenes, he's captured by the island of Neopagans he's been investigating for kidnapping his daughter, and they use him in a ritual to increase honey production on their island. Here's a tip: they'd probably make a lot more honey if they didn't put all their bees in bags. Even with context, actor Eric Freeman's performance in Silent Night, Deadly Night Part 2 is ridiculous (which is admittedly fitting, given the film's theme). Freeman, as Ricky Caldwell, suffers a psychotic break after his older brother goes on a Santa-themed killing spree in the first Silent Night film, and subsequently follows in his footsteps. As far as pre-murder proclamations go, this one is probably among the least ominous. Just yelling stuff that's happening isn't a very effective threat, but Freeman's ability to act without blinking is pretty scary. There are few movies as universally panned by comic geeks as Joel Schumacher's Batman & Robin, which offered a sharp—and unwelcome—departure from the darker vibe of Tim Burton's acclaimed Batman movies. Of all of the insane elements Schumacher incorporated, including sections of film played backwards and the appearance of Bane and his glorious veins, the Bat Credit-Card is the craziest. Batman whips it out to pay $7 million for a dance with Poison Ivy, ignoring all of the impossibly intricate financial funny business it would take to let the Caped Crusader pay with a credit card while protecting his secret identity as Bruce Wayne. Hint: when you're pretending to not be a billionaire, don't act exactly like a billionaire. Bryan Singer's original X-Men was good enough to set a franchise in motion and helped superhero films gain footing in Hollywood; it also gave Ray Park somewhere to go after he was chopped in half during Star Wars: The Phantom Menace. Of course, X-Men wasn't without an occasional flaw, as with the bizarre koan delivered by Storm to Park's character, the evil mutant known as Toad. Not only is her riddle unnecessary and weirdly timed, but it's scientifically inaccurate. We understand that heroes need cool catchphrases and stuff, but Storm's doesn't work. She should have just gone with, "Well, blow me down!" or something. We have to end with a movie that basically doubles as a classic collection of all-time terrible lines: Tommy Wiseau's The Room. Production was so fraught with problems that it inspired a book, The Disaster Artist, which then inspired a film about the book. 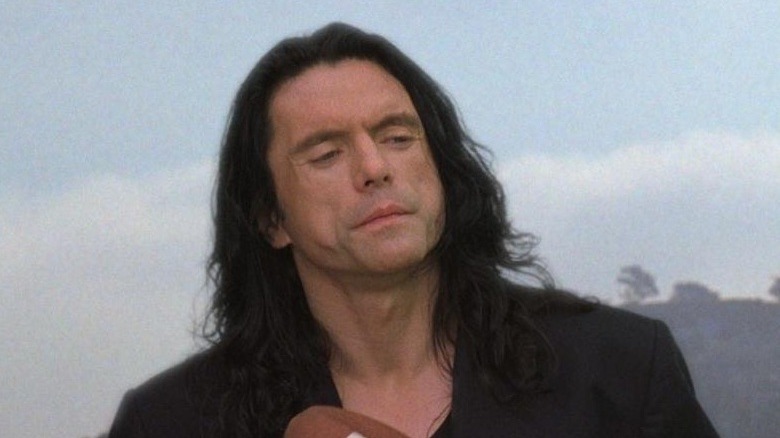 The Room is filled with bad dialogue from top to bottom, due in part to the director's insistence that his script be followed to the letter in spite of his apparently tenuous grasp of English. From Tommy's casual dismissal of spousal abuse to his mother-in-law's strange reaction to having cancer—not to mention the surreal flower shop scene with Doggie—the whole thing needs to be seen. We'll start you off with this one super-dramatic clip.